Location: Immediately S of railway bridge, and adjoining Jacobs antique market of which building is now part. Probaly early C19 house (appears to be on O'Rouke's plan of 1849), marked as inn on early C20 Ordnance Survey maps and situated on what was formerly wharf of Glamorganshire Canal. Two storeys, three windows wide. Slate roof and red brick chimney. Smooth render with pilaster strips and band course between storeys. First floor windows small-pane hornless sashes, end windows 8 panes over 8, central window opening the same size but fitted with narrower sash with 6 panes over 6 and flanking panelled infill. Ground floor windows small-paned horned sashes. Central entrance doorway has triangular pedimneted doorcase with fluted pilasters. Panelled reveals to doorway. 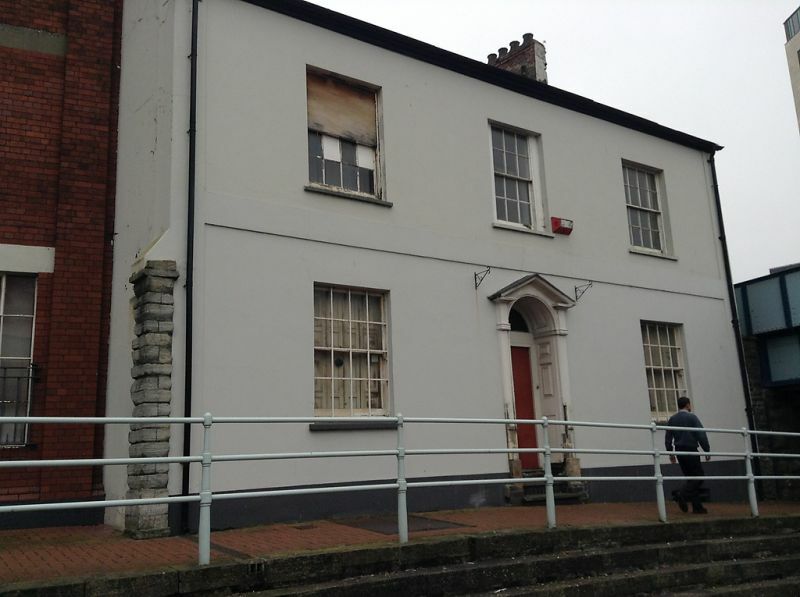 Listed as rare surviving building of this period in central Cardiff. At S end of St Mary Street.